Of all the places to dine in Downtown Akron, one of the newest ones can be found at 22 East Exchange Street: Pizza Fire, a pizza restaurant with a new and different twist. 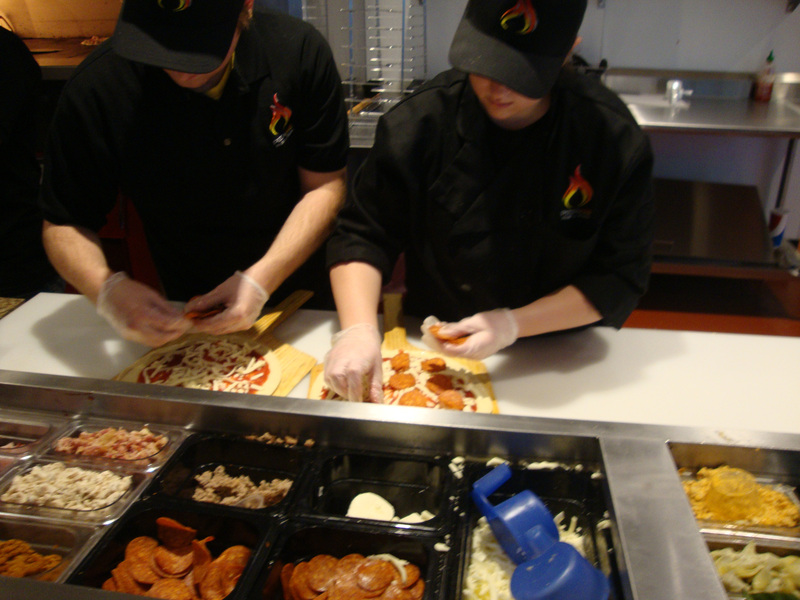 Pizza Fire gives customers the chance to have the staff build their own pizza right in front of them, and cook and have it ready in a matter of minutes. After hearing about its new opening, I decided to travel there on a cold and rainy Tuesday afternoon. The restaurant itself is well advertised from the outside, and as soon as I walked in, the warmth and smell of fresh pizza hit me quickly. The inside of the restaurant itself has a sleek and modern style, and has many tables and bar-esque seating against the windows. There is a big screen television in the corner, and the entire restaurant was extremely clean and well modeled. When I first sat down with Pizza Fire founder and CEO Sean Brauser, his passion for the Northeast Ohio area and the industry became very apparent. He was raised in Hartville, Ohio, and graduated from Lake High School in Uniontown, just 20 minutes from Akron. After graduating from Bucknell University in central Pennsylvania, Brauser began working in New Jersey at a pharmaceutical manufacturing company, but soon left that job to open up his first pizza restaurant at the age of 24. He returned to Northeast Ohio and opened the first Romeo’s Pizza in Medina in 2001, and the chain has quickly grown to 36 locations since then. Brauser first came up with the concept of Pizza Fire about two years ago, and after some careful planning, found the perfect location in Downtown Akron. “We got lucky with the location and space. It was previously a different pizza restaurant, and it was obvious that it would be the perfect location for the first Pizza Fire,” he said. “We’re at the juncture of Downtown, The University of Akron campus, and the nightlife.” The restaurant space was quickly designed and set up, and the first day of business for Pizza Fire was Sunday, October 12. 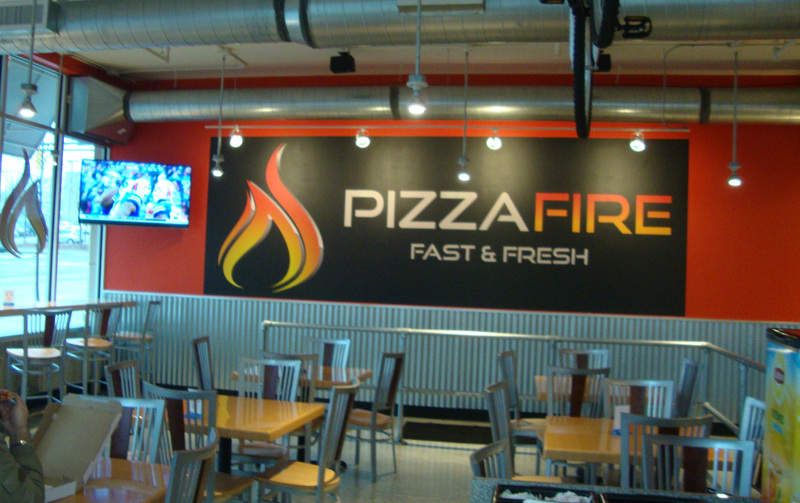 Approaching the order line, Pizza Fire definitely has the feel of a Chipotle or Subway-style system. All of the ingredients are laid out in plain view for everyone to see and choose from. Customers start at one end of the line and first choose which one of six sauces they would like, followed by their choice of five different cheeses. After that, it’s onto toppings, where there is a choice between 11 different meats and 18 different vegetables. When it was my time to order, I admittedly had a tough time deciding between all of the different possibilities, but finally settled on a pizza with authentic Neapolitan pizza sauce, shredded mozzarella cheese, and topped with pepperoni, mushrooms, and green peppers. The staff did a great job pointing out all of the different options available. After my order was complete, the staff put it in the oven, and I grabbed a drink and sat back down at my table in the restaurant, and the pizza was ready about 90 seconds later. Cut into six slices, the first thing I noticed was the crust. It wasn’t too thin or thick, and had a great crispiness to it. The rest of the ingredients were light and fresh, and it all combined to create a great-tasting pizza. After eating about half of my pizza, I grabbed a box and packaged the rest of my pizza to take home with me. All in all, it was a great experience, one that is definitely different from any pizza restaurant I’ve ever been to before. The restaurant was clean, the staff was friendly and helpful, and the pizza was delicious and came out extremely quickly. 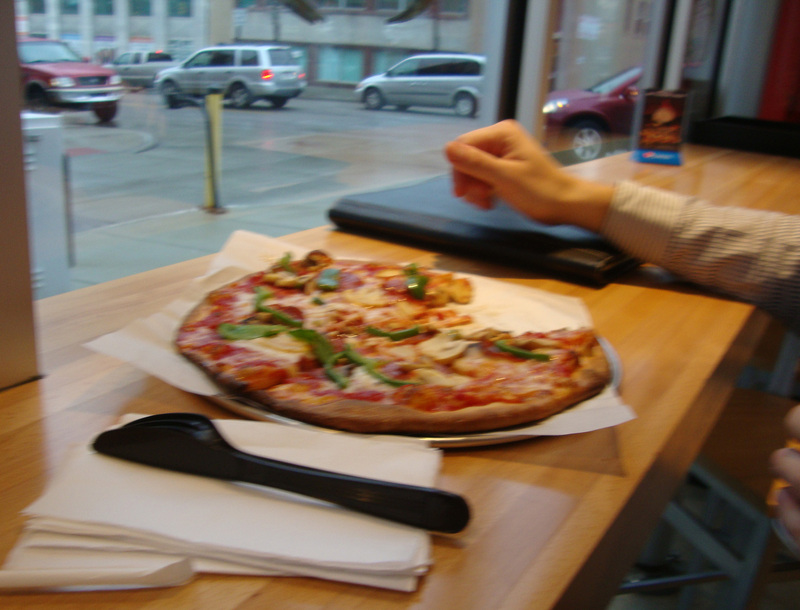 It is an ideal place to grab a quick bite at anytime, as one could easily walk in the door, design and order their own pizza, sit down and eat, and be out the door in 20-30 minutes at most. Brauser also mentioned his desire to expand and open up at least eight new Pizza Fire locations in the near future, stretching from Cleveland to Canton, and even expressed interest in opening up locations as far as Columbus and Pittsburgh as well. Pizza Fire is open seven days a week: Monday-Thursday from 11 a.m.-11 p.m.; Friday & Saturday from 11 a.m.-2 a.m.; and Sunday from 12 p.m.-9 p.m. They are now offering delivery services to downtown locations during lunch hours as well. Pizzas can also be called in or ordered online ahead of time and picked up anytime during business hours at (330) 535-4545 or their website. By: Brent Flanik, Downtown Akron Partnership Intern.